His wife warned him not to go. He insisted. 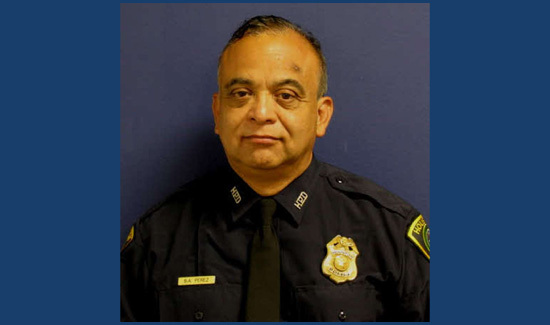 Steve Perez, a 34-year-veteran of the Houston Police Department, drowned in his patrol car in Harvey floodwaters, a tearful Chief Art Acevedo said Tuesday afternoon. Perez, days shy of his 61st birthday, was in his patrol car driving to work downtown Sunday morning when he got trapped in high water. Acevedo said Perez left home at 4 a.m. and spent more than two hours trying to get to his duty station in downtown Houston. When he could not find a path, he followed department protocol and tried to report to the nearest station, in Kingwood. When he did not arrive for regular roll call Monday, officers called his wife, who said she had not seen him since Sunday. They narrowed their search to the Hardy Tollway and Beltway 8, Acevedo said. Acevedo, with tears in his eyes, said officers believed they had found Perez on Monday night but could not recover his body. “We could not put more officers at risk for what we knew in our hearts would be a recovery mission,” he said. Search and rescue crews, including a dive team and a “Cajun Navy” member, recovered his body from an underpass on Tuesday, Acevedo said. The officer’s death is the 15th fatality in Texas claimed by Hurricane Harvey or the rains it spawned after making landfall. The storm has pushed the city’s first response abilities to their limit; Houston police officers and firefighters and other first-responders have rescued thousands of Houstonians over the past four days. “Sometimes you find a way to make it happen, or you die in trying. Sgt. Perez lost his life because he tried to make it happen, he tried to get at his post…that’s the ultimate sacrifice,” he said. The officer’s union, as well as police agencies across the country, mourned his death. He is survived by his adult son and daughter and his wife, Cheryl, who told him not to go into work in the heavy rains. That message was echoed by his father-in-law, a Korean War veteran, Acevedo said.